Syst. Veg., ed. 15 bis [Roemer & Schultes] 7: 641 1829. Origin and Habitat: Western Cape, Little Karoo (from Cogmanskloof in the West up to De Rust in the East), South Africa. 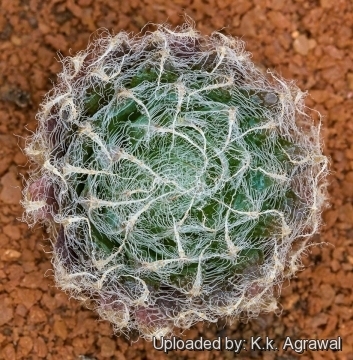 Description: Haworthia arachnoidea var. setata, formerly known as Haworthia setata, is one of the forms of Haworthia arachnoidea which is a widespread and morphologically variable taxon. 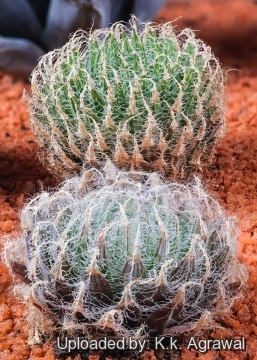 It has rosettes variable in shape and dimension distinguished from the type species for its longish leaves ending in a sharp tip, with denser, softer, white transparent bristles at the margins and keels. Leaves are much softer than var. scabrispina. From var. aranea it differs, that leaves and spines do not blacken on dying, also var. aranea is more softer on touch. It resembles a small ball of fur, especially in the dry state. M.B. Bayer (1976) considers it a synonym for H. arachnoidea. Rosette: Variable, (3-)5-7,5 cm in diameter (in var. gigas V. Poelnn. up to 12 cm), usually solitary, eventually offsetting to form clumps. The rosettes are completely closed in dry weather but open with high humidity. Leaves: 30–40 per rosette, dense, multifarious, all ascending, oblong-lanceolate, 2,5-3 cm long, 12-15 mm broad, and 4-5 mm thick at the middle, pale glaucous green, turgid on the face, not pellucid at the apex, rounded on the back and tipped with a long pellucid awn, margin ciliated with spreading lanceolate-cuspidate, soft, hair-like teeth about 2 mm long. Inflorescence: Peduncle simple, 15 cm long. Raceme lax, simple, 15 cm long. Pedicels very short. Bracts small, deltoid. Flowers. Perianth 12-15 mm long; limb half as long as the tube. Notes: Haworthia arachnoidea var. 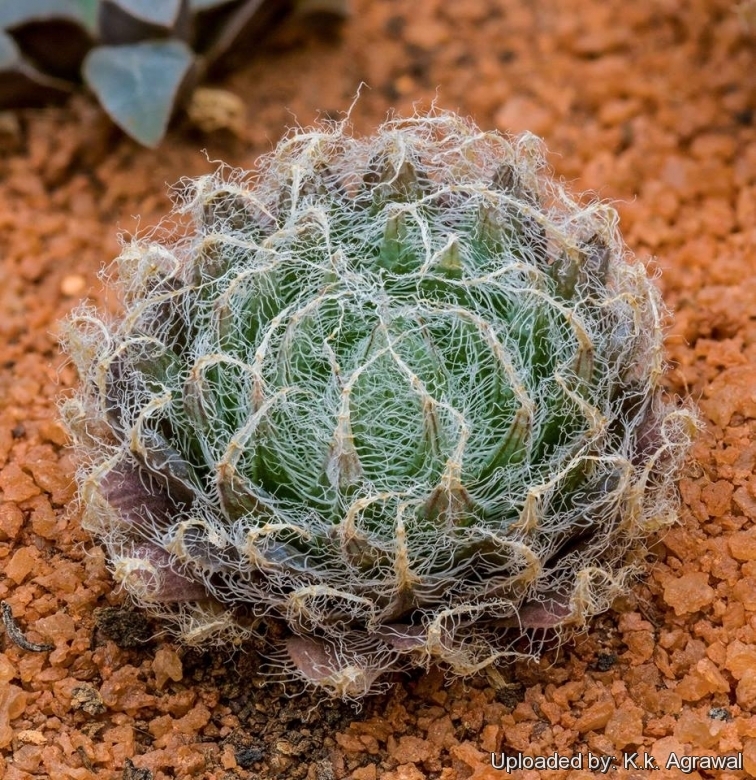 setata is quite variable and is connected to Haworthia mucronata in some places - for example at Montagu and Tradouw Pass (Haworthia tradouwensis). At Montagu intermediate forms with mucronata were described as 'laxa'. Around Ladismith is growing a very attractive form, which is very white and roundish. 9) Haworthia arachnoidea var. setata in: Jakub Jilemicky, http://haworthia-gasteria.blogspot.it/2013/05/h.html, Awesome Inc. theme.